"Right now, I am the most important man in New York City." Writer/director/producer Larry Cohen (It's Alive) continued his series of darkly witty horror films with Q—The Winged Serpent, a 1982 opus concerning the ancient Aztec winged serpent god Quetzalcoatl. The story concerns a series of mysterious ritual murders in New York City, under investigation by Detective Shepard (David Carradine) and Sergeant Powell (Richard Roundtree). Meanwhile, small-time crook and ex-junkie Jimmy Quinn (Michael Moriarty) accidentally stumbles upon a huge nest in a creaky high-rise building following an abortive jewel heist. Shepard's research leads him to conclude that a small cult's living sacrifices have somehow reincarnated Quetzalcoatl, and only Quinn knows where the creature lives. What makes Q—The Winged Serpent work is Cohen's ear for dialogue and use of authentic New York City settings. Today, Canadian locations often stand in for major American cities, where filming costs have become prohibitive—but Cohen's movie has an off-handedly realistic New York feeling that makes the fantastic elements of his story believable. His actors take the material seriously as well, lending weight and gravitas to what might otherwise have been a run-of-the-mill creature flick. This isn't to say that the film itself is completely serious—Cohen's script features some great one-liners and marvelously funny/violent visual moments, but the actors keep it from becoming spoofy. Michael Moriarty is particularly impressive as the cowardly, opportunistic Quinn, shamelessly looking to profit from his knowledge despite the moral urgings of his girlfriend Joan (Candy Clark). He's a good-hearted but small-minded man, not a hero in any sense of the word, and his characterization is one of the bravest and most complex ever seen in a genre film. If Q has a failing, it's in the special effects department. There are some fine images early on, before the creature is really seen, and one particularly effective tracking shot of the serpent's shadow cast against tall buildings. The design of the creature is impressive, with leathery wings and vicious talons attached to a lithe, serpentine body. But the stop-motion animation has dated badly, and some close shots of the creature are out-of-focus as though appropriately-scaled models were beyond the film's budget. There are some effective shots combining the animated model with aerial footage of the city, and a few on-set puppets are carried off well, but the effects weren't state-of-the-art even when the film was released. Fortunately, the movie doesn't rely heavily on its special effects, depending instead on its realistic setting, clever dialogue, naturalistic performances and Larry Cohen's wicked, satirical sense of humor. Q—The Winged Serpent succeeds where so many genre films fail, by remembering that even the most outrageous stories are ultimately about people. Image Transfer Review: Anchor Bay presents Q—The Winged Serpent in its original 1.85:1 widescreen aspect ratio with a solid non-anamorphic transfer. Black levels are on the light side and some compression artifacts and moire patterns occasionally show up in shots of New York City buildings, but the source print is in fine condition (just a few flecks and one noticeable splice) and the digital transfer generally looks terrific, with rich color and detail. Even by today's DVD standards, this 1998 transfer of a 1982 film looks great, as good as Q is ever likely to look. Audio Transfer Review: Q—The Winged Serpent is presented in Dolby Digital 2.0 monophonic audio, decoded to the center speaker. This is a fine mono soundtrack, featuring a dramatic orchestral score by Robert O. Ragland and solid subwoofer-level bass, especially impressive considering the age of the film. Dialogue volume varies a bit against the score and atmospheric sound, requiring some experimentation to find a comfortable listening level. But dialogue is clear, the frequency range is broad enough to capture the score's high notes and the ominous flapping of Quetzalcoatl's wings, and the soundtrack is remarkably hiss-free—a fine transfer from Anchor Bay. Extras Review: Anchor Bay's Q—The Winged Serpent DVD features 12 chapter stops and nothing more (though a full-color keepcase insert reproduces the poster art from the film's release as The Winged Serpent). Oddly, the disc does not appear to be time-stamped—at least on my system, it just reads "PLAY" for the duration. The lack of any real supplements is disappointing for a cult film of this stature. 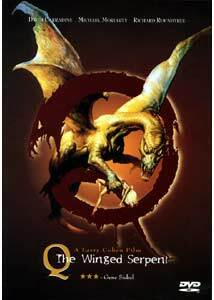 Larry Cohen's Q—The Winged Serpent is a witty, well-acted monster movie that wisely avoids dependence on its low-budget special effects. Anchor Bay's high-quality DVD transfer makes this cult classic well worth a viewing, though the lack of supplements makes it harder to justify a purchase. Recommended.